So, when one of our clients casually asked if we would consider offering our Interactive Counselor Training Workshop on a regional basis so that colleges in the area could come and get the training they want and need, quickly and affordably, we were all in! And we suggested the focus be on yield. We are delighted to announce that for a limited time, Longmire and Company’s highly regarded counselor training is coming to you! At a cost you can afford. Colleges all over the United States hire us to come to them. To develop customized training to help their counselors work better and smarter, and have richer, more productive conversations with prospective students and parents that will lead to more (and more desirable) enrollments. There is no more important time than right now to coach your counselors in the finer points of moving students along the recruiting continuum and ultimately sealing the deal. So we’ve developed a special day-long workshop that we’re bringing to your geographic area. 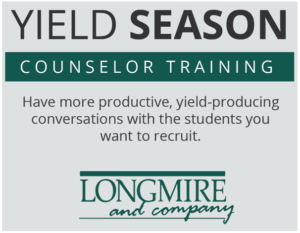 A number of colleges and universities will be serving as regional host sites where nearby colleges can send counselors to participate in a full-day intensive Yield Season Counselor Training Workshop that will prepare counselors for yield season success. This very affordable workshop is designed to benefit seasoned counselors just as much as counselors who are going through their first full recruiting cycle. Best of all, counselors you send will return home with skills and techniques that can be shared with the whole admission team. We are selecting centralized geographic locations where counselors can easily drive to the event in the morning and be home for dinner the same night. The Bottom Line: You can Up Your Game this Yield Season for a minimal investment in time and money and a maximum return in your enrollment. 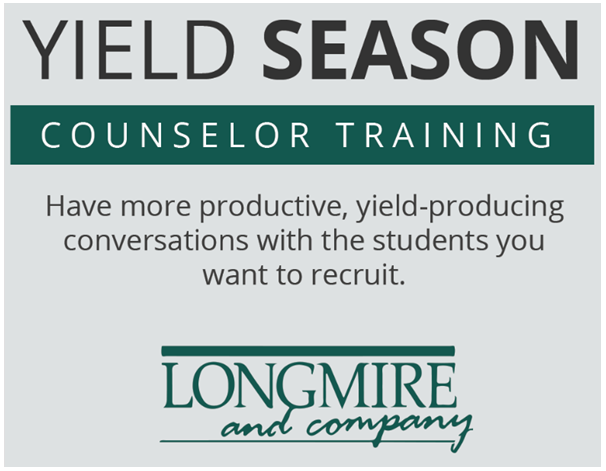 Our Yield Season Counselor Training Workshop is a comprehensive, highly interactive one-day program that incorporates our game-changing student-centric approach to recruiting. Colleges and universities that adopt the student-centric approach find that it is very is powerful. The skills and techniques that will build relationships that lead to enrollment are trainable. Through our Interactive Counselor Training Workshops we spend a great deal of time changing the focus of admission counselors. We see their transformation and improvements in productivity. Most importantly, we see changes in the recruiting process that exposes students to the information and experiences that truly interest and excite them. The net result? Improved service to prospective students and families, measurable increases in yield, increased counselor and staff job satisfaction, enhanced teamwork, and innovations in work process within the department. We see it work every day. Hire the right people, put them in roles that let their strengths shine through, and give them the proper training and tools so they can populate the institution with students who will be successful and committed to the institution long after graduation. We have already scheduled Yield Season Counselor Training Workshops in Missouri, Indiana, Kentucky and Texas and we are adding more. If you are interested in attending a workshop, suggesting a location, or even hosting a workshop, ask for details here. In this season of Thanksgiving, we want our friends from the world of admissions and enrollment management to know how thankful we are for all that you do. Thank you for your amazing work ethic in a hectic and fast-paced world. Thank you for your passion for education and for the colleges and universities you represent. Thank you for your compassionate efforts on behalf of the students you work with. In the hustle and bustle of your everyday world you may forget the enormous impact you have. You deserve many thanks. And we want you to know how very grateful we are. Next week, we will continue our discussion on the best ways to grow and control enrollment. This week, our wish for you is a well-deserved celebration with family, friends and food. Right this minute, all over the country, college-bound students are in the throes of making what is most likely THE biggest decision they have ever made: “Which college is right for me? Will the college accept me? Can I afford it?” Their parents are offering guidance and counsel because they know this is a crucial decision. Certainly, they too have a hugely vested interest in being certain that the final decision is the “right” one. 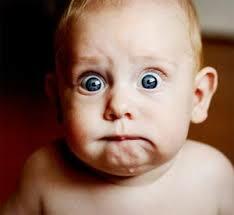 Let’s face it: For nearly every student and their parent this is a period of high-anxiety . No college would want to do anything that would ADD angst to an inherently stressful process, right? No college would do so intentionally but as an industry we do it all the time. Are you ready for some good news? Since these things happen more than you can imagine it gives you an opportunity to differentiate your college or university by doing the opposite. You can differentiate your institution by RELIEVING rather than ADDING stress to the college selection process. Communicate often and artfully. Students want information that’s relevant to THEM. Provide helpful advice and counsel throughout the college shopping process. BE RESPONSIVE. Return calls and emails promptly. Treat each prospective student as you would expect and hope to be treated. Above all, show a sincere interest in the student. These may seem obvious but it’s amazing how many colleges fail to practice these proven behaviors that will serve a prospective student and parent well. Every student has a unique combination of needs, preferences, perceptions and motivations. Identifying and dealing with all of them enables the college to have a deeper and stronger relationship with the prospective student. Uncovering them requires that the college focus on the student rather than the institution. Longmire and Company’s on-campus Interactive Training Workshops improve the performance of counselors and staff in areas such as effective communication with students and parents, applying creative entrepreneurship to their jobs, validating past and planned actions against outcomes, and discovering and leveraging the motivations of students (and themselves). The end result is improved service to prospective students and families, measurable increases in yield, increased counselor and staff job satisfaction, enhanced teamwork, and innovations in work process within the department.